If you've been following the pattern of the first series of Doctor Who serials, you know what kind of serial you'll be getting after watching the one called The Aztecs. 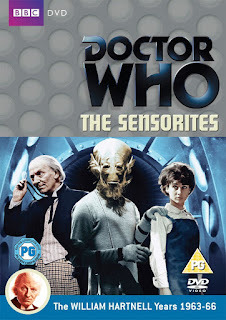 Historical serials are followed by science fiction serials, and the sci-fi story of The Sensorites takes the Doctor and his companions from Mexico in the year 1454 to deep space sometime in the 28th century. The TARDIS has jumped through time and space again to materialize on board a space ship with a crew that at first appears to be dead. However, it is quickly revealed that the crew members - Captain Maitland, Carol Richmond, and Carol's troubled fiancé John - have actually been trapped in orbit around a planet called the Sense-Sphere, which is home to creatures called Sensorites that control their technology and their minds. The Sensorites can even put them in a sleep so deep that it appears to be death. The crew is British, but they're from a England that's very different from the one the Doctor's companions Ian Chesterton and Barbara Wright, residents of 20th century England, are familiar with. London went out in the 24th century, Big Ben doesn't exist anymore, and the entire lower half of England is taken up by Central City. Of course, odd facts like that are only mentioned in the show because it was made for an English audience and they were out to make viewers chuckle at the thought of this possible future. Because of things like that, I was resistant to The Sensorites at first. This seemed like some really schlocky, ridiculous sci-fi, especially when the first Sensorite is revealed just floating in space outside one of the ship's windows. The Sensorites are some goofy looking creatures, dressed in onesies and sporting upside down beards. (Rather than growing down from their chins, the beards grow up over their faces.) 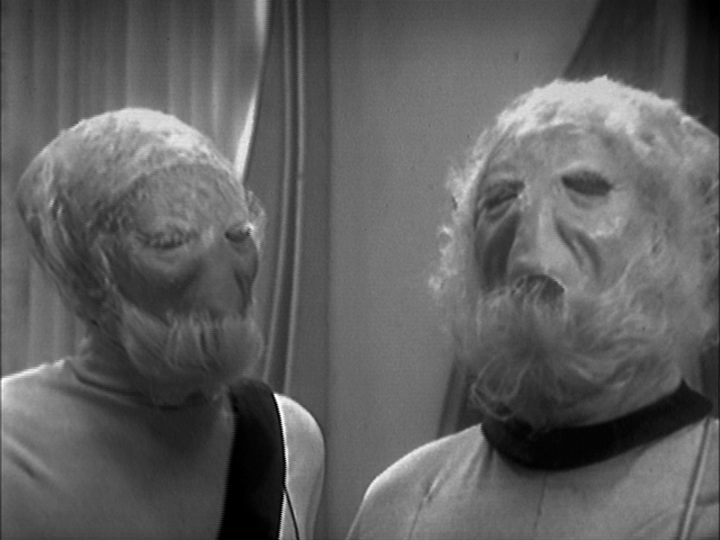 But they're goofy looking in a way that is also kind of appealing, and even though it took me a couple episodes to adjust to The Sensorites and get into it, I never disliked it. It always had a certain entertaining charm to it. Especially in that laughable jump scare moment of the Sensorite outside the window. 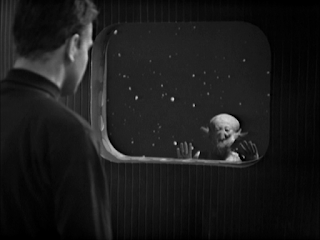 The first two episodes, Strangers in Space and The Unwilling Warriors, were a bumpy ride for me, but at the end of The Unwilling Warriors the Doctor, Ian, and the Doctor's granddaughter Susan depart the space ship, going down to the Sense-Sphere to get to the bottom of what's going on (and to retrieve the TARDIS's stolen lock) after a line of communication is opened with a telepathic conversation between Susan and Sensorites. Once the characters were on the planet, that's when the serial really clicked for me. Over the next four episodes - Hidden Danger, A Race Against Death, Kidnap, and A Desperate Venture - I became much more interested in the story and invested in what was going on. While Barbara stays behind on the space ship, which allowed actress Jacqueline Hill to take a couple episode break from the show's shooting schedule (a well deserved break, since she played a major role in The Aztecs), the other characters discover the truth about this whole situation and learn what's really happening between the humans and the Sensorites. This isn't a simple story of people being terrorized by weird aliens; the Doctor and his companions find both allies and enemies among the Sensorites, and there are some twists and turns along the way. The Sensorites have been stricken by a deadly illness they suspect the humans are responsible for in some way, but while on the Sense-Sphere, Ian catches the illness as well. The Doctor believes that the water on the planet is to blame, so to get to the bottom of the issue he must venture into an aqueduct that is said to be inhabited by monsters. The Sensorites isn't the greatest, it took me a while to warm up to it and it starts to feel too drawn out before it wraps up, but it's worth checking out. 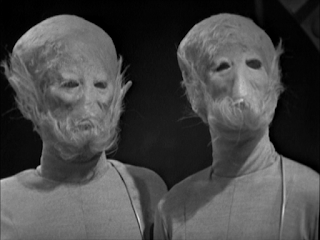 It's carried along by intriguing mysteries and the Sensorites are definitely aliens that have to be seen in action.